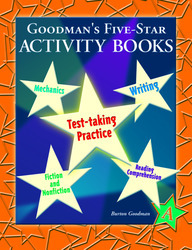 Goodman's Five-Star Activity Books help students master the kinds of exercises frequently found on state and national tests, focusing on comprehension, vocabulary, and mechanics. The Activity Books reinforce and extend the literary themes in Goodman's Five-Star Stories. Use the activities in conjunction with that series or independently. "A Trip to The Gambia"
"The Life of the Rain Forest"